Every October in the United States is known as American Pharmacists Month and the American Pharmacists Association - APhA celebrates the activities of pharmacists and educates the public, patients, policymakers and other health professionals about pharmacists and their expanding role in patient care as vital members of the healthcare team. The month-long observance identifies the impact that pharmacists have on refining the medication use and advancing patient care throughout all practice settings. 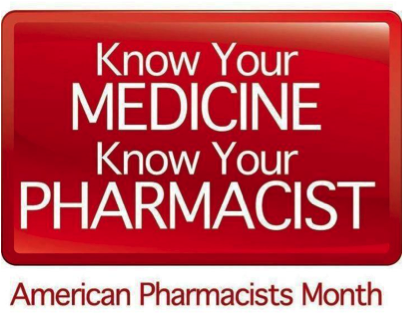 It is a way to inspire and stir up the pharmacy profession, and also exciting for the community to - Know Your Pharmacist and Know Your Medicine, the theme for American Pharmacists Month. The APhA message is based on unique essential fact seen in pharmacies, clinics, and other healthcare sites every day; however, the more that patients interact with their pharmacist it will help them to know more about their medications. During the American Pharmacists Month, the APhA makes a special effort to promote awareness about the broad array, its services, and how pharmacists offer - beyond the safe distribution of medication - such as education, prevention and general wellness. While few examples are as follows: seasonal and lifespan immunizations; medication reviews to measure safety, efficiency and effectiveness, interactions and adherence; care management through proper counseling for disease states such as diabetes, high cholesterol, and high blood pressure; and smoking cessation counseling, etc. The main goal of APhA is to highlight the importance of this special month and to support the people and profession’s engagement. The APhA dedicates part of its website to American Pharmacists Month, so that everyone can have a look and they are able to know about the tips on outreach and messaging to spread the word. This helps to spread a variety of ideas which not only inspire the activities and events, but also improves the promotional items featuring the theme and logo. In addition to pharmacists, APhA encourages student pharmacists, pharmacy technicians, and chapters of the APhA Academy of Student Pharmacists - APhA-ASP to use any of this information while celebrating on campus and in the community. In 2016, the American Pharmacists Month was celebrated with great events and number of activities by APhA, some include a Capitol Hill Health Fair held on September 22nd; where the general public, members of Congress and staff, got their flu shots and health screenings, including bone density, cholesterol, glucose, blood pressure, and body composition; and media and social media campaigns. If you want to take place in such events and participate in any fun activities then visit your nearest pharmacy which conducts health-related community events.